In 1972 nearly 5,000 children were participating in this program. In order to get a better education than they could receive at home, these kids, as young as 8 years old, enjoyed free clothing as well as free room and board, during the school year in a foster home, with foster parents who had been recommended by their bishops. The Mormon Church’s “Indian Student Placement Program” came to an unofficial end in the year 2000, but it has been in the news this summer because of a current lawsuit alleging sexual abuse perpetrated on children enrolled in the program during the 1960s and 1970s. President Monson’s deposition, which was to take place on August 4th, did not occur. But the fight didn’t end there. Craig Vernon, an attorney for the alleged victims, continues to believe President Monson can provide relevant information that is necessary to their case. In a renewed request to depose LDS Church President Monson, Mr. Vernon has presented an interesting line of reasoning in court papers filed on August 8th. By quoting past Church official Ezra Taft Benson (an apostle at the time of his above quoted remarks, later elevated to the position of Church Prophet and President), Mr. Vernon has placed the Mormon Church in a difficult position. 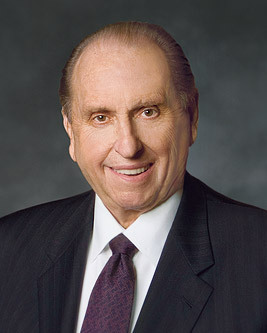 If the Church wants to maintain its argument that President Monson should not be deposed due to lack of particular knowledge, it might need to disavow President Benson’s remarks – remarks that were quoted and affirmed as recently as the Church’s 2010 October General Conference. But in that case, the authority and trustworthiness of the Mormon prophet would be undermined, and many Church manuals would need to be rewritten. The Church might choose to just ignore Mr. Vernon’s doctrine/policy-based argument altogether, and focus its efforts elsewhere in order to keep President Monson from being forced to submit to the deposition subpoena. This option seems most likely. According to Fox 13, while it isn’t uncommon for LDS leaders to be subpoenaed for deposition, “it is rare for them to actually give any testimony.” President Monson was summoned to appear in a British court in 2014, but Church attorneys kept the prophet out of the courtroom and were eventually able to see that the summons was withdrawn. “he believed President Monson had ‘unique information’ he could provide for the case and his testimony under oath was necessary. Vernon said he would like to conduct it soon, pointing to Monson’s age and health. Thomas Monson is 89 years old and in poor health incident to age.